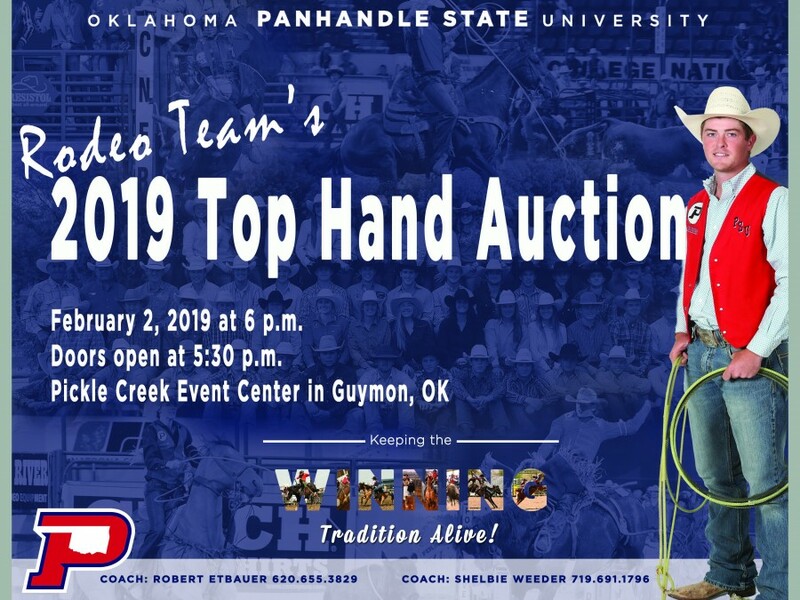 Submitted by Erika Chartrand on 01/22/2019 The Oklahoma Panhandle State University Rodeo team members and coaches would like to invite the community to the annual Top Hand Auction Saturday, February 2nd at 6 p.m. at the Pickle Creek Event Center in Guymon, Okla.
Goodwell, Okla. — The Oklahoma Panhandle State University Rodeo team members and coaches would like to invite the community to the annual Top Hand Auction Saturday, February 2nd at 6 p.m. at the Pickle Creek Event Center in Guymon, Okla. Doors open at 5:30 p.m. The evening is free for everyone who would like to attend and will begin with a delicious barbecue meal courtesy of Hunny’s. The auction will follow featuring numerous western items for everyone’s taste. You can look forward to some awesome finds such as a horse shoe table; stunning quilts; western jewelry; a stud fee; gift certificate to Browns Meat Locker; bits and tack; a tv; a painting by the talented artist, Chance Hays; and so much more. Don’t miss your chance to own a one-of-a-kind western item. An evening of fun-filled entertainment is guaranteed along with the chance to get to know the top collegiate rodeo athletes. Also, if you’ve been wanting to get something done and just don’t have the help to do so, you will be glad to know that pairs of Panhandle State Rodeo Team students will be auctioned off for a days’ worth of work. Lastly, Ken Stonecipher and the Wooden Nickel Band will be back to get the party going. Come enjoy some great music and dance the night away with us! The community is crucial to the rodeo team’s success. Proceeds from the Top Hand Auction will help bring rodeo professionals to Panhandle State for schools, pay livestock expenses, and aid in general rodeo operations. Thank you for your support and be sure to follow the Panhandle State’s Rodeo team as they strive to keep the winning tradition alive!